Krenko had a strong stomach from a childhood of eating out of gutters, but Mr. Taz made him uneasy. This was the third time they'd met to discuss business, and Taz's strange appearance was always the same. He looked human, but his face fit too loosely on his skull, and his skin didn't seem attached to his skeleton. When Krenko thought about it too hard, he could imagine Taz's entire epidermis slithering off and sliding down into a fleshy puddle around his feet. "How is your lamb, Mr. Krenko?" Taz asked. They were in a smoky pub near the Smelting District—Taz's choice. Not in bloodwitch territory, but just by a smidge. This was good because Krenko despised the Rakdos thugs. Too unpredictable, and not in the way Krenko liked. "Umm, yum," Krenko took an obligatory bite and considered his options. 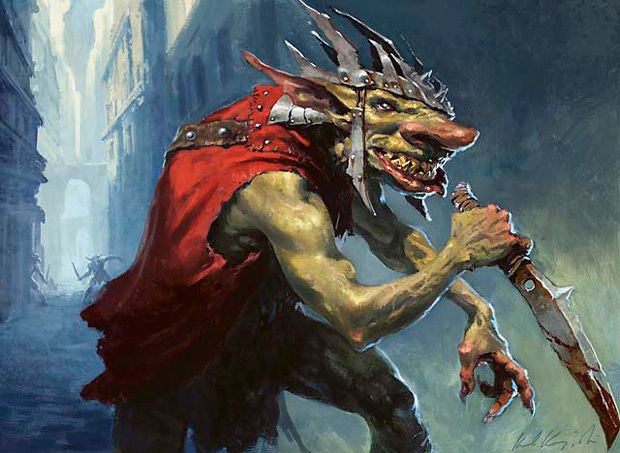 Taz wasn't a lich or necro-thing, or Krenko's exceptional goblin nose would have detected it. In fact, Taz smelled quite expensive, like almonds and clean rabbits. Krenko analyzed how the skin wobbled beneath Taz's eyeballs and bunched up around his knuckles. Oh, it was so obviously a skin-suit—and not a very tailored one at that. "I trust you find the task appealing?" Taz continued. His neck was straight down—no bump at the throat—like a female human. But his voice was low and gravelly. "It's gutsy," Krenko said approvingly. "Yes, but you have proved yourself to be a master of bold maneuvers." "Thanks to you, Mr. Taz," Krenko said. He fondly remembered the last job, the one with the exploding Azorius statue and flaming saprolings. Yes, Krenko liked this slippery-face man who kept offering him delicious jobs. As a young goblin just getting his start, a well-connected patron was a gift Krenko never expected. Besides, Krenko had a healthy respect for anything that could claim itself ugly and not give a rat's tail what the rest of the world saw. "All right," Krenko said finally. Krenko had no doubt in his ability to carry off the heist, but he marveled again that Taz trusted a lowly goblin with such a task. Most thought goblins were pests at worst and pack animals at best. "I'll do it." "I have no doubt you will," the man said mildly. He slid a velvet bag across the table. Light escaped through the seams. "Here is a special tool to help you in your endeavor." Krenko peeped inside, grinning when he saw the glowing shiv nestled against the velvet. "Aw, you know me so well." "Brilliance recognizes brilliance," Mr. Taz said mildly. "And you're sure about what you want me to bring back?" Krenko asked. "Maybe there's something more valuable I can pick up for you?" "No, Mr. Krenko. The item I requested will make me quite happy." Taz smiled with his ill-fitting lips and disappeared into the crowded pub. 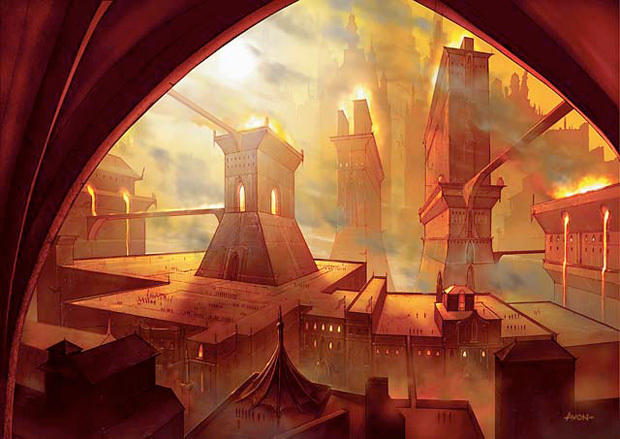 With Taz's enchanted shiv tucked in his boot, Krenko began his surveillance on Sunhome, the imposing Boros guildhall. After an hour on a rooftop with a spyglass, Krenko was hot and bored, and had learned little new: the Boros still loved straight lines and hard work. 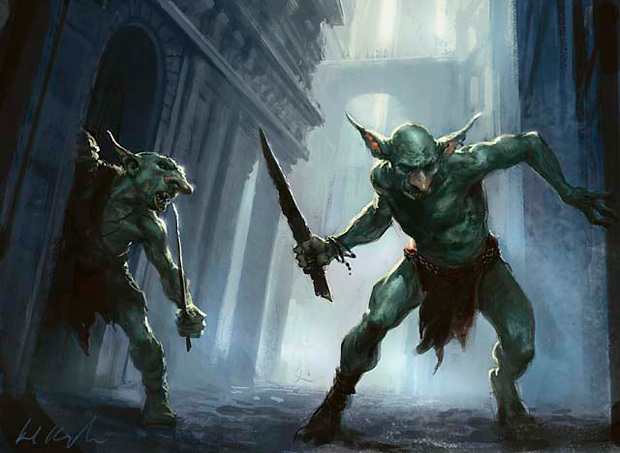 And Krenko still couldn't believe that goblins joined the guild willingly, but there they were: Digging trenches, washing barracks, and loading corpses onto a Golgari corpse-hauler. Krenko wondered if an average day resulted in that many dead soldiers or if something had happened beyond the scope of his eyeglass. The next morning, Krenko swaggered into Sunhome's mess hall like he owned the place. The cavernous hall fed a thousand soldiers at a time. They sat in front of platters of hot food on long tables that seemed to stretch for miles. It was noisy and hot, but the abundance of free food answered one of Krenko's longstanding questions. 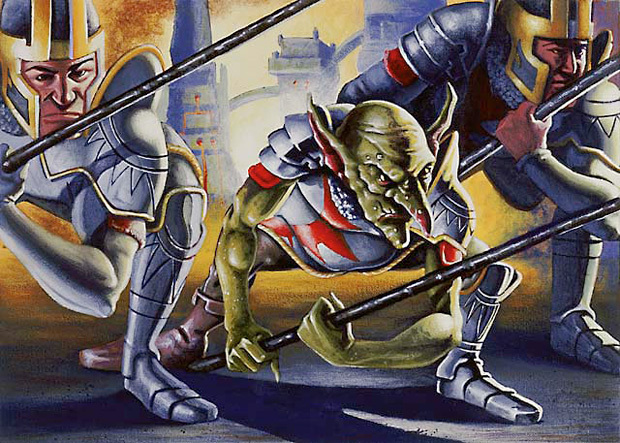 Suddenly, goblins in Boros made a lot more sense. "It's come down to a duel," he informed the woman seated across the table. She had a bandage on her forehead. "Who drew the line? Aurelia?" she asked. She kept her voice low like she didn't want to be easily heard. But the man spoke louder than necessary. "No, the nosy Azorius found it in the fine print," he said. "I find that hard to believe," the woman said doubtfully. "Aurelia let it stand?" "Why shouldn't she?" the man practically shouted. "She could crush Vinrenn in a heartbeat." Suddenly, Krenko's bench tipped dangerously and several soldiers clambered to their feet. "Shut your mouth, grunt!" someone shouted and a fistfight erupted between the tables. Krenko picked up his plate and headed to the other end of the hall. Such undisciplined hot-headedness seemed very un-Boros. Krenko took a deep breath, enjoying the tension seething in the room. Yes, this was going to be as fun as it was lucrative. The next day, Krenko went looking for trouble. And he found it everywhere. In Sunhome, tempers were high, and the rank and file were more interested in squabbling than their daily chores. Krenko joined a goblin maintenance crew on one of the gigantic balconies that jutted from the blocky edifice. "If I want to get a look at Feather, where should I go?" he whispered to the hook-nosed goblin next to him. He'd been polishing the wall for nearly an hour and nothing useful had happened. The goblin had a couple of patches on his uniform, but apparently they weren't enough to get him out of manual labor. "Shhhh! She says you got to call her Guildmaster Vinrenn now," he spoke very slowly as if Krenko was an idiot child. "Whatever her name is, where do I find her?" Krenko asked. "Where you from, some Gruul outhouse? Top floor, but you better stay away." "What is going on?" Krenko asked. "I just got here from the Rubblebelt." The goblin looked smug. "Yeah, I knew you were Gruul. Well, it's crazy around here. Aurelia's gonna be our new master, 'cause she says that no disgraced angel's got the right to rule. Vinrenn's gonna be banished. As long as she makes no trouble, she'll keep her life. Now, no more talking or I'll report you. Got it?" The goblin's self-importance filled Krenko with loathing. This place was teetering on the edge. All it needed was a little push. Chaos is the best cover, and Krenko went about setting fires and kicking down doors. Floor 1: an incendiary rumor in a willing ear; Floor 2: punched yesterday's pompous goblin on his fat nose; Floor 3: spark bombs; Floor 4: actual bombs. By the time he reached the top tier, the halls were filled with the sound of thudding boots and alarmed shouts. Outside, swords clashed on the balcony. And no one noticed a snaggletooth goblin enter the chambers of Vinrenn, aka Feather, the guildmaster who apparently lacked control. Krenko found himself in an empty room under an open skylight. Harsh sunlight shone down on a glassy detention sphere, which hovered above the blood-red fist emblazoned on the tile floor. A white-winged angel was in magical stasis inside the cell. Her wings tucked around herself like a baby bird, she appeared to be sleeping. After a cursory look around the chamber, Krenko took his glowing shiv from his boot and poked at the sphere. Nothing happened, so he stabbed it again. And again. Nothing. Ugh, why would Taz give him a glowy shiv unless it was better for smashing than a regular shiv? At first, the sphere seemed like it was made out of light and mist, but when Krenko traced the surface with his palms, he felt something solid near the top. He took the shiv and slammed its handle against the invisible piece. There was a sucking sound and blue lighting zinged across the room. 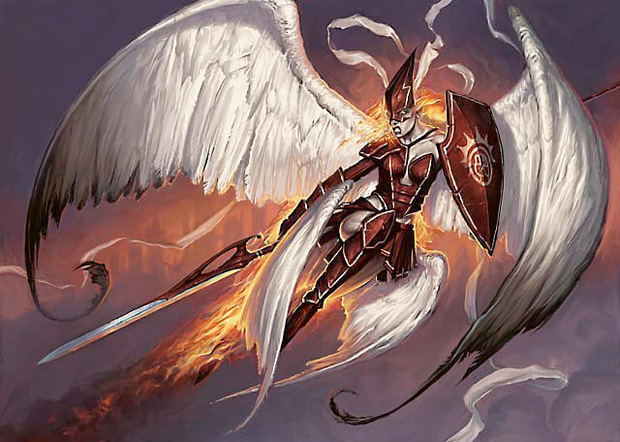 With another good smash, the sphere dissipated, sending the angel tumbling unceremoniously to the floor. Hearing footsteps approaching in the corridor, Krenko quickly plucked two feathers from the angel's wings just as she began to stir. "Help!" Krenko screamed, running for the door. "She tried to escape! She's free. She attacked me!" 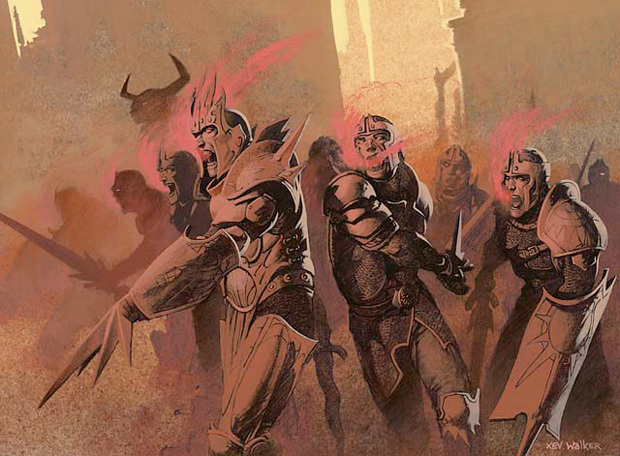 Suddenly, broad-shouldered guards crowded the room, and Krenko dodged legs to get to the door. As he scampered out, an armored minotaur dragged the angel to her feet, her protests falling on deaf ears. Just as Krenko reached the front gate, a large explosion rocked Sunhome. Not one of his, Krenko thought gleefully. Yes indeed, chaos was the best tool of all. 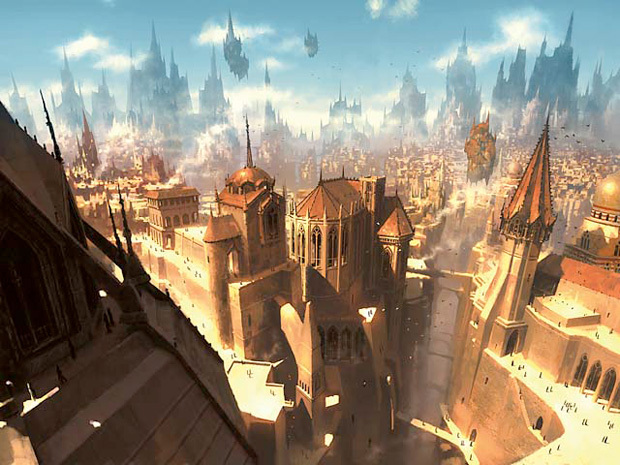 At sunset, Krenko met Taz on the Millennial, an aerial platform with the most coveted views in all of Ravnica. You had to be someone to get a ticket to come up here. Some Ravnicans waited their entire lifetimes. Most would never get the chance. Taz was waiting for him by the appointed marker, staring out at the eye-boggling maze of buildings and streets. "Sometimes I forget to look at the sky," Taz said as Krenko handed him a wooden box. Inside was a white angel's feather. It seemed to glow red under the setting sun. "Entire days go by, and I never see the sun at all." Krenko grunted in agreement. He knew what it felt like to be a rat in the darkness. "I'm exceptionally pleased," Taz said. "Your payment is being delivered to your establishment as we speak. Krenko beamed. With coin like that, he could buy Azzik and Pondl breakfast every day if he wanted to. Not that he did. Krenko extended his hand to close the deal, but instead of shaking it, Taz handed him a silver key with the Orzhov symbol carved into the shaft. "An Orzhov safebox," he said. "This key is all you need to retrieve the money." Krenko's ears perked up. "Whose money?" "Feather's, actually. She earned a salary as a Wojek for a time. But she won't need it anymore." "Why don't you keep it for yourself?" Krenko asked. "Consider it a bonus payment. For a job well done." Mr. Taz smiled, and the skin on his face sagged beneath his jaw bone. "You have management skills, Mr. Krenko. I can see you as the boss of something grand." Krenko pocketed the key and cocked his head. "What else, Mr. Taz?" "Oh, just a trifle. While you're in the Orzhova, perhaps you could pick up a little something for me?"